Setsuko Thurlow’s voice and participation throughout the Humanitarian Initiative has influenced and motivated NGOs and diplomats alike — from moving interventions at intergovernmental conferences in Nayarit Mexico and Vienna, to the Open Ended Working Group on Multilateral Nuclear Disarmament at the United Nations in Geneva and the ban treaty negotiations at the UN in New York. Her personal story and commitment to nuclear abolition clearly influenced and contributed to the adoption of the Treaty on the Prohibition of Nuclear Weapons, as well as the Norwegian Nobel Committee’s decision to award ICAN the Nobel Peace Prize. For her life long extraordinary contribution to nuclear disarmament and the ban treaty process, Setsuko was chosen to receive the Nobel Peace Prize, together with ICAN’s Executive Director Beatrice Fihn. 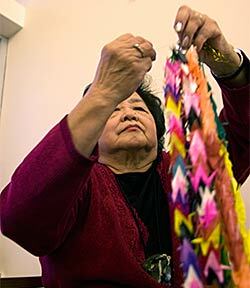 Hibakusha Stories is a member organization of ICAN. Our Director Kathleen Sullivan was brought to Australia for the inauguration of ICAN in 2007 — to write the campaign’s first youth-oriented educational materials. A team of Hibakusha Stories members travelled to Oslo for the Nobel Peace Prize Ceremony and related events. Setsuko’s Nobel Lecture moved Crown Princess Mette-Marit of Norway to tears, as well as the many ICAN members, Ambassadors and UN Diplomats in attendance at Oslo City Hall. Don’t give up! Keep pushing! See the light? Crawl towards it. No matter what obstacles we face, we will keep moving and keep pushing and keep sharing this light with others. Kathleen Sullivan and Amber Cooper-Davies teamed up to produce another beautifully animated short film. If You Love This Planet brings to life Setsuko’s passionate call to action, on the day that the Treaty on the Prohibition of Nuclear Weapons was adopted at the United Nations – 7 July 2017. As a 13-year old schoolgirl, Setsuko Thurlow found herself in close proximity to the hypocenter of the atomic blast that rocked Hiroshima. A survivor of one of the most pivotal events in modern history, she displayed great courage and leadership, sharing her experiences in order to sensitize people to the consequences of armed conflict on civilian populations and to promote lasting peace. She worked in Toronto for decades as a social worker in a number of agencies including the Toronto Board of Education and she established the Japanese Family Services of Metropolitan Toronto, serving Japanese-speaking immigrants. In addition she contributed to breaking the silence of people around the world concerning nuclear issues and initiated many anti-nuclear activities. 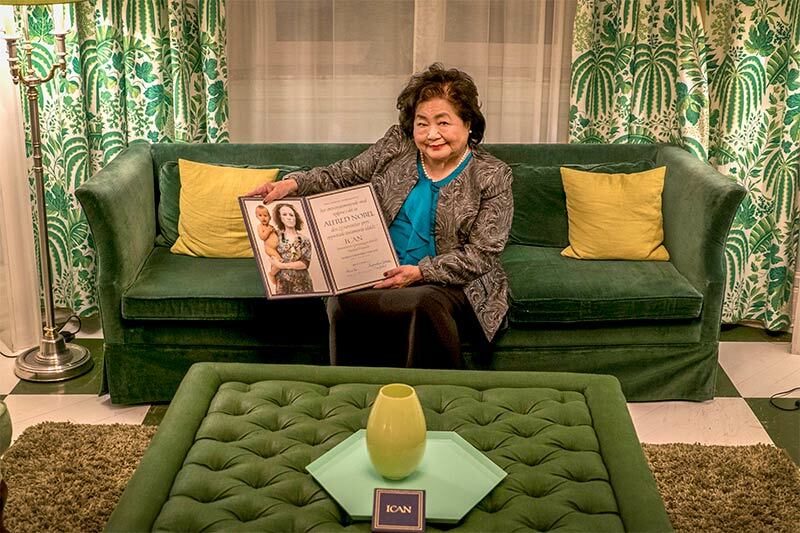 “The first day of Setsuko Thurlow’s school visits, to Flushing High School in Queens, New York City’s oldest public high school, she arrived halfway into the session. The car service that was to pick her up in central Brooklyn never arrived. She hailed a car in the driving rain and the driver had no idea where she was going. She left that car and, with the aid of a friendly policeman she spotted nearby, she was put in a car that found its way to Flushing. Without skipping a beat, this 78 year-old woman began interacting with a group of 120 students. When it was discovered that not only was she a member of the church of Reverend Tanimoto but that he had convinced her parents that it was okay to marry a non-Japanese man and he an officiant of the service, there were audible gasps. Many of the students had read John Hersey’s Hiroshima and Reverend Tanimoto was one of the central figures in that historic narrative of the bombing that, to this day, remains one of the most widely read accounts of the bombing of Hiroshima. History came alive at Flushing High School that day. “As a young member of the church of Reverend Tanimoto, Setsuko served as an interpreter for Dr. Norman Cousins, the editor of the influential Saturday Review. One evening during the programming of May, 2010, Setsuko Thurlow and Shigeko Sasamori and several other hibakusha had dinner at the home of Sally and Bob Silverberg, Norman Cousins’ nephew and Shigeko’s cousin. “Setsuko said, ‘I want here and now to thank the Cousins family. We will be forever grateful for the tremendous contribution Dr. Cousins made in the rebuilding of Hiroshima and for his great concern for and contribution to the humanitarian and human dimensions of the suffering of hibakusha.’ Dr. Cousins was a graduate of Theodore Roosevelt High School in the Bronx. It is our wish that the students we touch will be moved to greatness as exemplified by these two great global citizens. UN, ON MARCH 28, 2017. “As a survivor of the atomic bombing of Hiroshima, I feel a powerful commitment to tell the story of Hiroshima. The survivors are getting old and passing away, leaving a smaller number of us. We feel it is imperative to tell the younger generation of that terrible dawn of the nuclear age. All of us are familiar with the scenes of devastation in New York following the terrorist attacks. But that devastation extended only several blocks. Imagine the devastation of an entire city. “When I sit down to write down my recollections of that time, I have to brace myself to confront my memories of Hiroshima. It is exceedingly painful to do this because I become overwhelmed by my memories of grotesque and massive destruction and death. My message could be painful to you as well, as I intend to be as open and honest as possible in sharing my experience and perceptions. “On August 6, 1945, I was a 13-year-old grade 8 student at Hiroshima Jogakuin and a member of The Student Mobilization Program. I was one of a group of 30 students assigned to help at the army headquarters. We were on the second floor of the wooden building about a mile from the hypocentre, about to start our first day of work. At 8:15 a. m., I saw a bluish-white flash like a magnesium flare outside the window. I remember the sensation of floating in the air. As I regained consciousness in the total silence and darkness, I realized I was pinned in the ruins of the collapsed building. I could not move. I knew I was faced with death. Strangely the feeling I had was not panic but serenity. Gradually I began to hear my classmates’ faint cries for help, ‘Mother, help me!’, ‘God, help me!’ Then suddenly, I felt hands touching me and loosening the timbers that pinned me. A man’s voice said, ‘Don’t give up! I’m trying to free you! Keep moving! See the light coming through that opening. Crawl toward it and try to get out!’ By the time I got out, the ruins were on fire. This meant that most of my classmates who were with me in the same room were burned alive. A solider ordered me and a few surviving girls to escape to the nearby hills. “I turned around and saw the outside world. Although it was morning, it looked like twilight because of the dust and smoke in the air. People at a distance saw the mushroom cloud and heard a thunderous roar. But I did not see the cloud because I was in it. I did not hear the roar, just the deadly silence broken only by the groans of the injured. Streams of stunned people were slowly shuffling from the city centre toward nearby hills. They were naked or tattered, burned, blackened and swollen. Eyes were swollen shut and some had eyeballs hanging out of their sockets. They were bleeding, ghostly figures like a slow-motion image from an old silent movie. Many held their hands above the level of their hearts to lessen the throbbing pain of their burns. Strips of skin and flesh hung like ribbons from their bones. Often these ghostly figures would collapse in heaps never to rise again. With a few surviving classmates I joined the procession carefully stepping over the dead and dying. “At the foot of the hill was an army training ground about the size of two football fields. Literally every bit of it was covered with injured and dying who were desperately begging, often in fain whispers, ‘Water, water, please give me water’. But we had no containers to carry water. We went to a nearby stream to wash the blood and dirt from our bodies. Then we tore off parts of our clothes, soaked them with water and hurried back to hold them to the mouths of the dying who desperately sucked the moisture. We kept busy at this task of giving some comfort to the dying all day. There were no medical supplies of any kind and we did not see any doctor or nurse. When darkness fell, we sat on the hillside, numbed by the massive scale of death and suffering we had witnessed, watching the entire city burn. In the background were the low rhythmic whispers from the swollen lips of the ghostly figures, still begging for water. “In the centre of the city were some 7,000 to 8,000 students from grades 7 and 8 who had been mobilized from all the high schools in the city to help clear fire lanes. Out in the open, close to the explosion, which was about one million degrees at the centre of the explosion 500 metres above the ground, nearly all of them were incinerated and were vaporized without a trace, and more died within days. In this way, my age group in the city was almost wiped out. My sister-in-law was a teacher supervising her students at this task. Although my father and I searched for days turning over dead and burned bodies, we never found her body. She left two little children as orphans. “Others were terribly burned but lived for several days or weeks. My sister and her four-year-old son were crossing a bridge at the moment of the explosion and both were horribly burned, blackened and swollen beyond recognition. We could later recognise my sister only by her voice and by a unique hair-pin in her hair. They lingered for several days without medical care of any kind until death at last released them from their agony. The image of my little nephew, Eiji representing the innocent children of the world, compels and drives me to continue to speak of Hiroshima, no matter how painful it may be. Soldiers threw their bodies in a ditch, poured on gasoline and threw a lighted match. They turned the bodies with bamboo poles, saying, ‘The stomach is not burned yet’, ‘The head is only half burned’. There I was, a 13-year-old girl, standing with my parents, witnessing the most grotesque violation of human dignity on my sister and little nephew with no tears or other appropriate emotional response. A friend of mine, Miss Sasaki, later told me of returning the next day to where her home had stood and finding the skeletons of her entire family and not being able to shed any tears. The memories of this kind of behaviour troubled me for many years until I studied the psychological reaction to massive trauma. “The unique and mysterious effect of the atomic bomb was radiation which affected many people. For example, my favourite uncle and aunt were in the suburbs and had no external injuries. But a couple of weeks later they began feeling sick with the appearance of purple spots on their bodies, nausea and loss of hair and so forth. We did not know then that the sickness was due to radiation. According to my mother who cared for them until their deaths, their internal organs seemed to be rotting and dissolving and coming out in a black liquid. Later we were told that if purple spots appeared on our bodies, this was a sure sign that we would soon die. Every morning, our routine was anxiously to examine our bodies for the dreaded purple spots. “My good friend, Muramoto Setsuko, was working on the fire lanes in the centre of the city with several thousand other high school students. She survived to tell us of the hell on earth she witnessed. As the twilight lightened, she was able to look around and find her classmates dead and dying around her. Those who were able to move crawled to Miss Yonehara, our math teacher. Forming a circle they started singing in faint voices familiar hymns including Nearer my God to Thee. One by one the students took their last breath and died. The teacher who was herself close to death, helped the remainder to go to the Red Cross Hospital, telling them to lean on her shoulders. My friend told of putting a hand on her shoulder and feeling the skin and flesh peel off. The hospital proved to be full to overflowing, with patients lying on the floor and on the ground. The teacher died soon after but Muramoto San lived to return to school in October. Later she, too, died of radiation. “Thus my beloved city of 360,000, close to ninety percent of whom were women, children and the elderly, suddenly and totally became desolation, heaps of ashes and rubble, skeletons and blackened corpses. By the end of 1945, approximately 140,000 had perished. However, the effects of radiation continue down through the decades, even to the present. The tragic legacy of Hiroshima has been extended not only to the people of Nagasaki three days later, but to American, British and Australian soldiers, Pacific islanders, North American aboriginal people, downwinders, Russians and other people of the former USSR, wherever uranium mining, weapon testing and actual use of nuclear weapons have taken place. “In that sea of rubble, life for us was a daily struggle for sheer survival. Where possible, many people fled to relatives and friends all over Japan. But often they felt they had to hide their identity as survivors because people feared contamination from these radiation exposed survivors of Hiroshima who people at that time understood to have an infectious disease. Employers were cautious about the potential poor health of employees and people were fearful of marrying a radiation-exposed person who might produce deformed babies. For a long time the national government did not provide any assistance and survivors felt abandoned. “After we could adjust to our traumatic defeat and surrender, most of us began to feel a great sense of relief and liberation after 14 years of war from the oppression of our ultra-nationalistic and militaristic government and society. The US Occupation authorities introduced democracy and needed reforms in education, agriculture, women’s political and social rights, labour unions, corporate structures and so forth. “In contrast, however, the Occupation authorities imposed psycho-social political oppression on Hiroshima and Nagasaki survivors. For example, within days of Japan’s formal surrender they introduced a Press Code in Japan. This permitted reporting on the technological triumph of the atomic bomb by the US but censored anything that might be considered to be criticism of the United States. The occupation authorities confiscated diaries, poems, photographs, movie film, medical specimens, slides for microscopes and doctors’ records on the treatment of radiation, some 32,000 items in all. Autopsies by Japanese doctors had to be done secretly in primitive conditions and the results passed from hand to hand under threat of prosecution. Because of this politically hostile milieu, survivors were deprived of the normal and needed grieving process following their massive trauma and had to repress their suffering in silence and isolation. “An additional injury to the psyche of the survivors was caused by the American establishment of the Atomic Bomb Casualty Commission in Hiroshima and Nagasaki. Its mandate was solely to study the effects of radiation upon human beings but not to offer treatment even though thousands were suffering from inadequate medical care. The ABCC did not even share it findings with Japanese doctors who were trying to deal with the new and unknown medical problem without adequate knowledge. The survivors’ sense of outrage at twice being treated as guinea pigs had to be repressed because of Occupation policies. “With the return of full sovereignty to Japan in 1952, a flood of political, scientific, medical and historical information became available enabling researchers, scholars and journalist for the first time to see the experience of the survivors in historical perspective and global context. Gradually they became aware that the main motive for the atomic bombings was political to impress the Soviet Union and to force Japan to surrender before the Soviet Union could enter the war against Japan so that the US need not share the victory over Japan with the USSR. They did not see it as a military necessity as the American government claimed. The survivors saw themselves as pawns in the opening moves in the Cld War rather than as sacrifices on the altar of peace. Some survivors became able to conceptualize and articulate the meaning of nuclear weapons as a threat to planetary survival. This ability enabled them to transcend their own personal tragedies and empowered them to become committed to the mission of warning the world of the dangers of the nuclear age. “At about the same time, information became available about Japan’s crimes and atrocities in the war so that we no longer saw ourselves solely as victims but also as victimizers of our fellow Asians. We began to pressure the Japanese government to acknowledge Japan’s past crimes and atrocities during the war. “We were stunned and appalled by the US tests of hydrogen bombs in the Pacific. The biggest was in 1954 and resulted in an ecological disaster. A Japanese fishing boat was contaminated by radiation. The whole crew became sick, one fatally, and the catch had to be destroyed. Because of repeated testing of H-bombs, the fish industry, involving a staple Japanese food, was severely affected because of widespread fear of radioactive fish. In addition, the islanders of Bikini suffered from a variety of symptoms of radiation including deformed babies. They also lost their island as a habitable home.